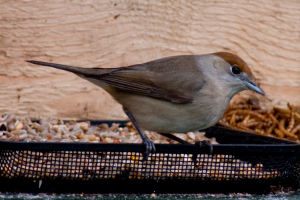 Observation - Blackcap at feeders - UK and Ireland. Description: Very pleased to see this female Blackcap today on my feeders. Have read various reports of these visiting gardens to feed in winter however this is the first time I have observed this. Very pleased to see this female Blackcap today on my feeders. Have read various reports of these visiting gardens to feed in winter however this is the first time I have observed this.